Sen. Elizabeth Warren, D-Mass., delivered a fiery call-to-arms at the Netroots Nation conference in Detroit on Friday, urging the liberal activists in the audience to fight back against the rich and powerful special interests that hold court in Washington. But before Warren could get a word in, she was forced to shush the audience after attendees broke into a chant urging her to run for president in 2016. "Run, Liz, run," the crowd shouted in unison, according to the New York Times. "Sit down people," Warren admonished. "Come on, let's get started." Warren unleashed a populist stemwinder in her address, roaring from the podium about the big banks and moneyed interests that have crowded out the voice of the American people. "They cheated American families, crashed the economy, got bailed out, and now the biggest banks are even bigger than they were when they got too big to fail in 2008!" she exclaimed, according to the Times. "A kid gets caught with a few ounces of pot and goes to jail, but a big bank launders drug money and no one gets arrested. The game is rigged!" Though Warren is only a freshman senator, her aggressive stands on Wall Street reform and student loan debt have endeared her to progressives, making her a fundraising powerhouse and generating calls for her to mount a presidential bid. She's also been a hot commodity on the 2014 campaign trail, stumping for Democratic candidates across the country, even those running in red states like Natalie Tennant in West Virginia and Alison Lundergan Grimes in Kentucky. While she was in Michigan, she also spoke at a fundraiser for Rep. Gary Peters, D-Mich., who's running for the Senate. 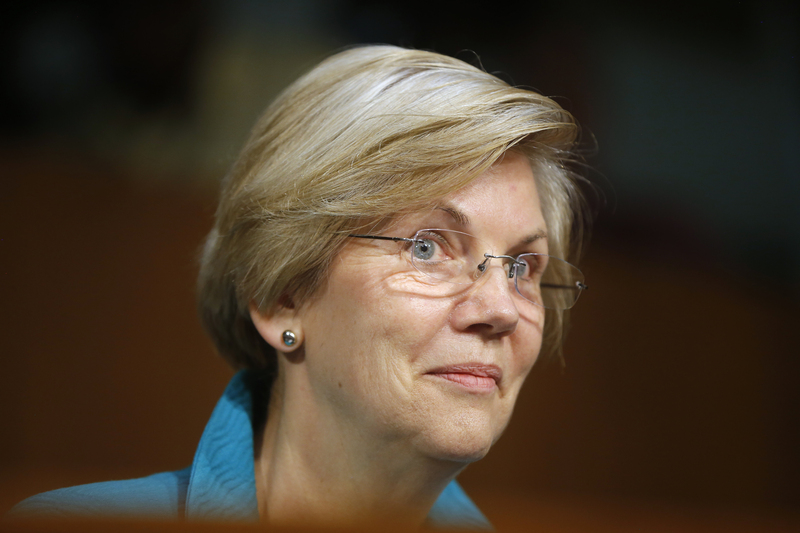 Despite a busy 2014 schedule, Warren has repeatedly said she won't run for president in 2016. But the energy of the left-wing activists in the crowd on Friday stands to color the next presidential race regardless of whether Warren throws her hat in the ring. "We are the Elizabeth Warren wing of the Democratic Party," Adam Green, the co-founder of the Progressive Change Campaign Committee, told the Times. "We intend to pressure every candidate, including Hillary Clinton, to see if they agree with Elizabeth Warren on key economic populism issues, like Wall Street reform, expanding Social Security, reducing student debt." Clinton, the prohibitive favorite for the Democratic nomination if she runs, did not attend the conference, but the contrast between Warren and Clinton was on the mind of many progressive activists who were there. "Elizabeth Warren tells it like it is," Marcia Riquelme, a co-chairwoman of a progressive group in Wisconsin, told the Times. "I appreciate Hillary...But I know that Elizabeth Warren has a perspective that is probably healthier. She has good economic principles. She has a depth of experience, and she knows how to share her deepest heart." "I think Hillary has a better chance of beating a Republican, but I think Elizabeth Warren is a better progressive," added Alyssa Aguilera, a community organizer from New York. Though Clinton did not speak at the conference, her backers were out in force. Ready for Hillary, an outside political action committee dedicated to backing a prospective Clinton candidacy, paid $10,000 to be a sponsor of the conference, according to the Times. Staffers and volunteers for the group diligently distributed materials and collected emails to grow their contact list. Not to be outdone, though, Warren's supporters brandished their own swag, handing out hats and bumper stickers that read, "Elizabeth Warren for President." The supporters were part of an organization, still unofficial, that has recently created a Facebook page and website urging Warren to run. The name of their fledgling outfit? "Ready for Warren."